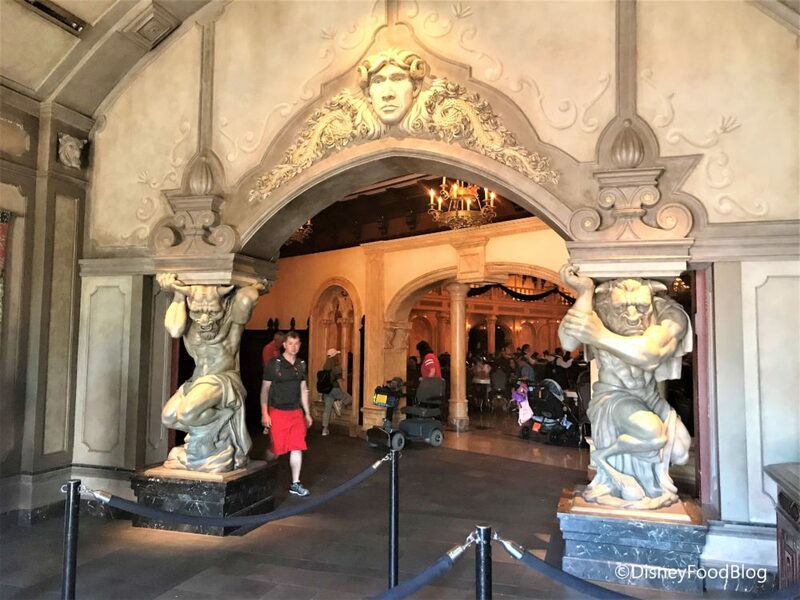 Heading into Be Our Guest Restaurant is like watching Beauty and the Beast come alive all around you! 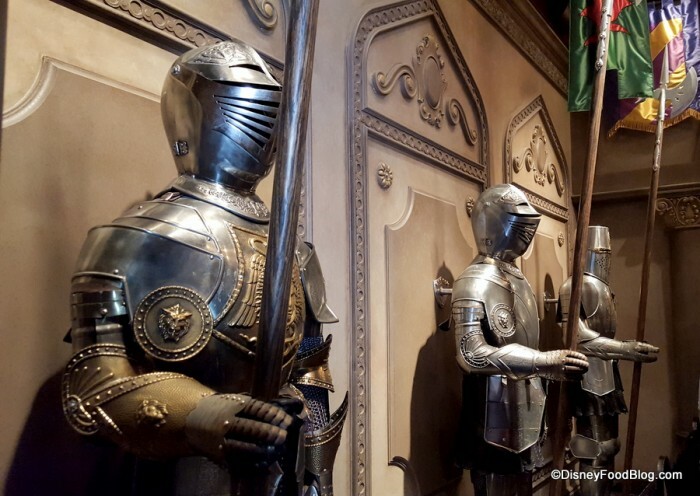 You’ll first pass through the Knight gallery where you’ll want to listen closely — the Knights of Armour sneeze, cough, and even talk to each other! 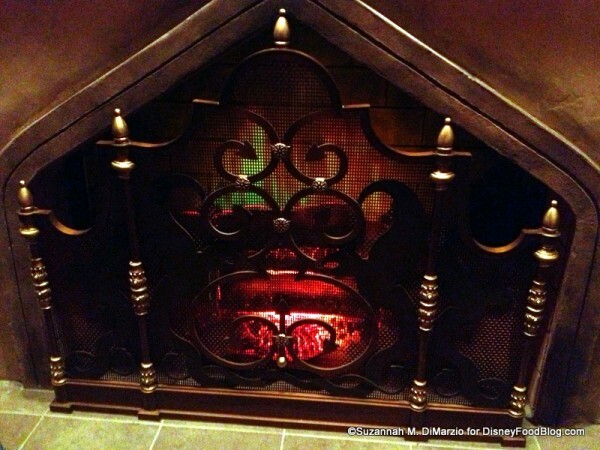 You’ll then pass into the Beast’s study, where you may recognize the Master’s chair and fireplace! Here you can order your food, and you’ll be given a magic rose to place on your table. After ordering your food, you can choose to dine in one of three rooms, the Ballroom, the West Wing, or the Rose Room. 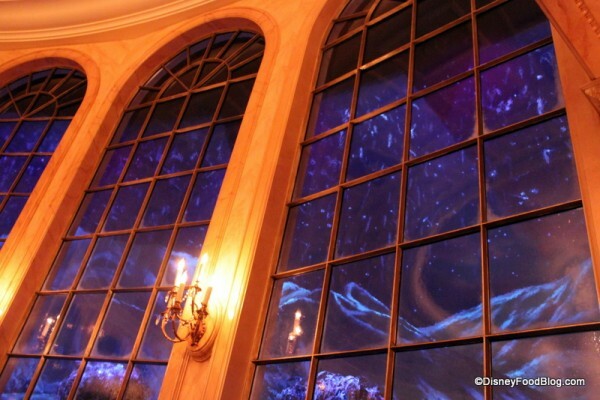 The Ballroom is the right out of the most iconic scene in Beauty and the Beast. 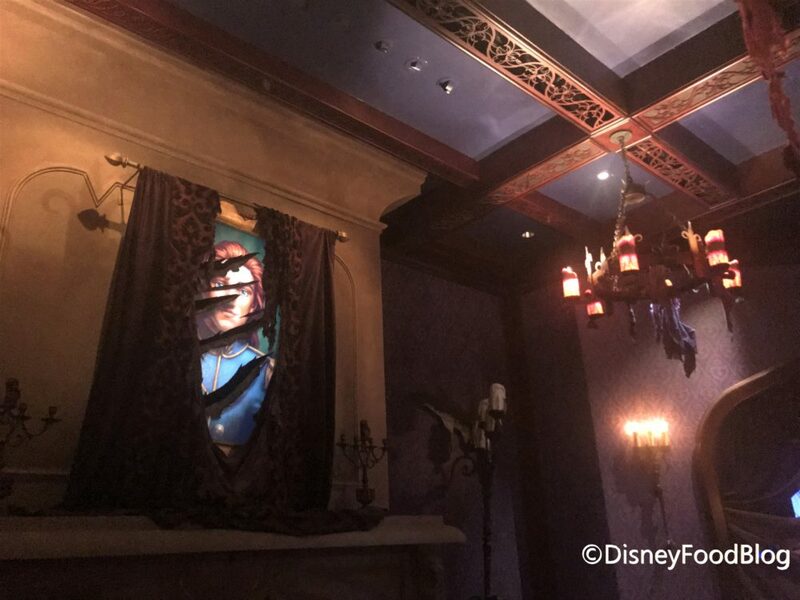 Giant chandeliers hang above you, and a beautiful instrumental score fills your ears. Make sure you go check out the windows — it’s snowing outside! And yep — that’s the same snow sequence you’ll see in the film! 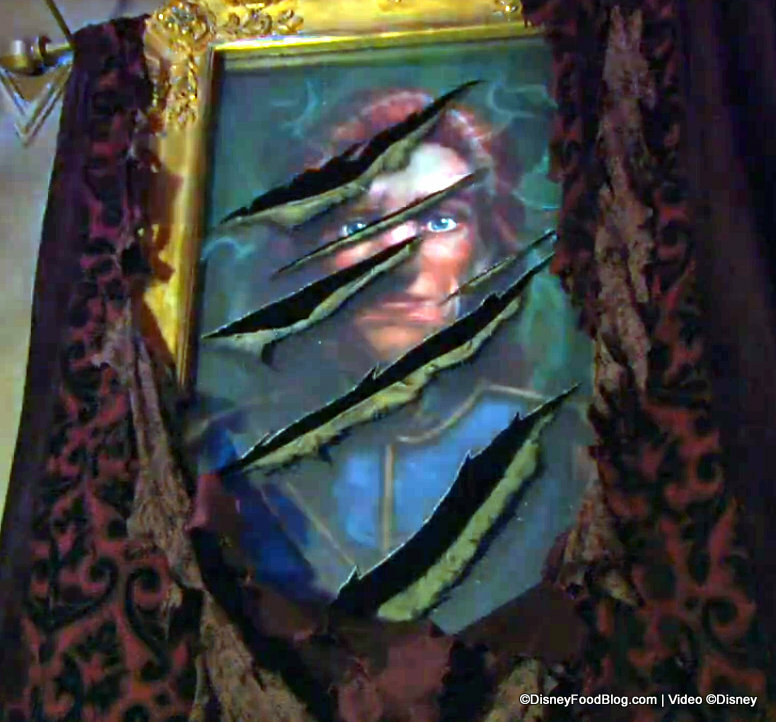 The West Wing is the most popular dining room, complete with an enchanted rose and portrait of the Beast when he was still a prince. Make sure to keep an eye on the portrait — it can turn “Beastly” before your very eyes. 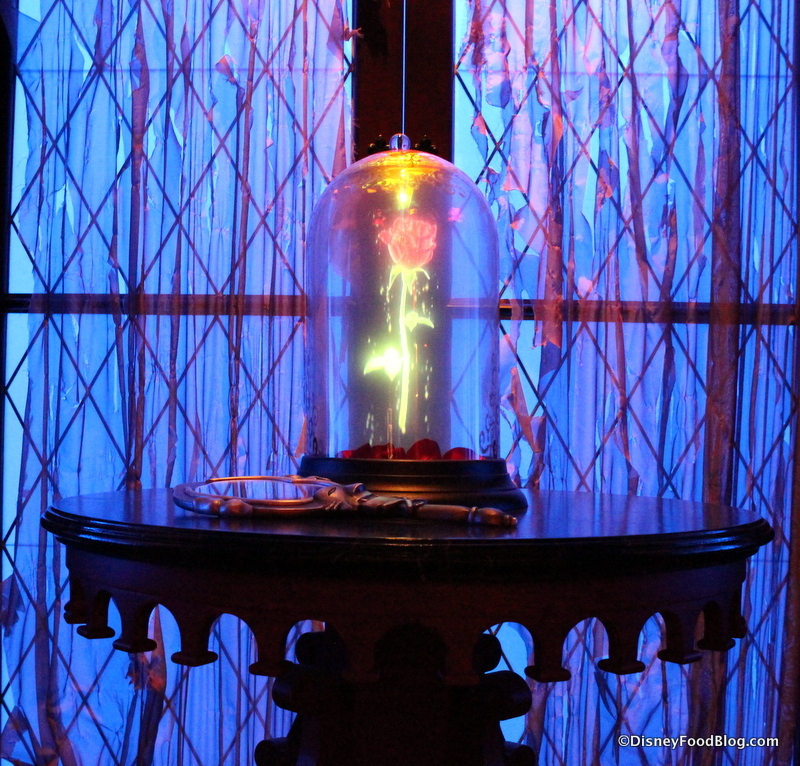 It does this every time the enchanted rose drops its last petal! 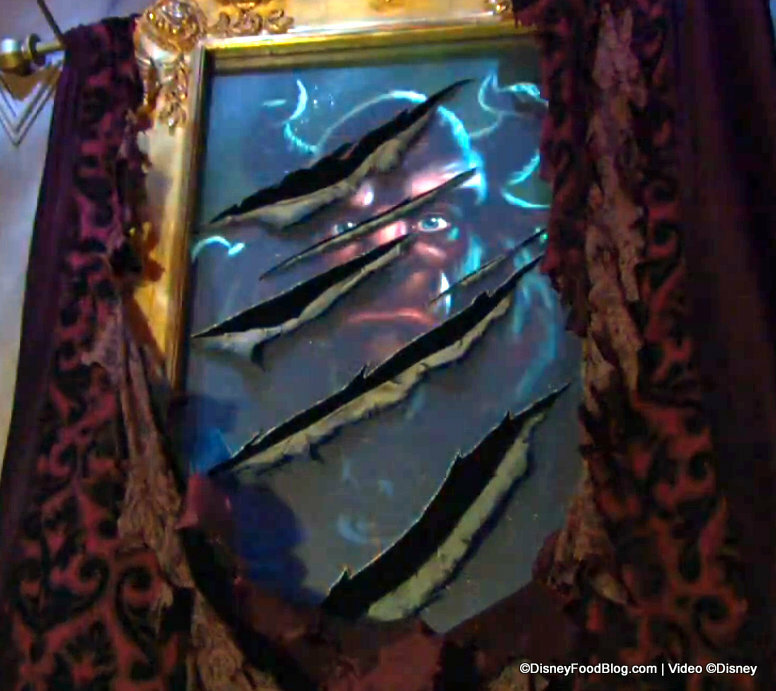 You’ll also notice the iconic mirror on the table with the rose. We should note that there are also some loud noises in this room (like a rumbling thunderstorm that gets louder and louder as the rose gets closer to dropping that last petal), so be prepared if you have a family member with sensory concerns. 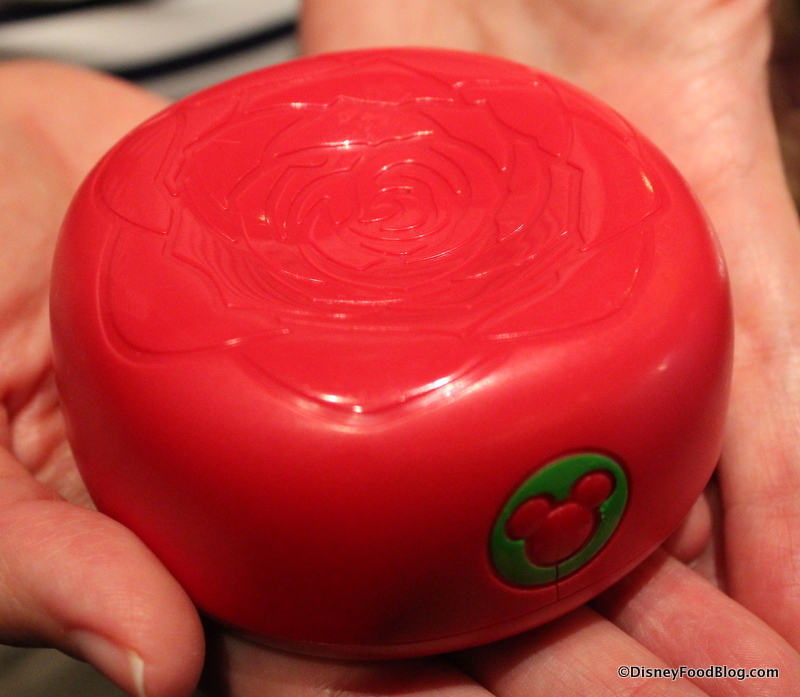 …and a giant Belle and the Beast music box spins at the center of the room. And the magic isn’t over once you’re done dining! One of our favorite details in the restaurant hangs as you exit. 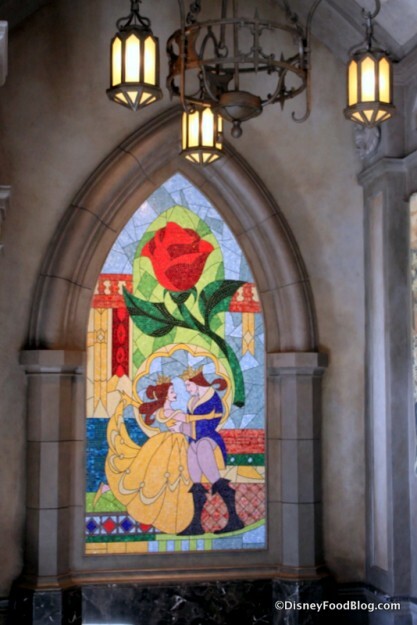 How gorgeous is this Stained Glass window? It is a perfect replica from the film and a fantastic photo opp. 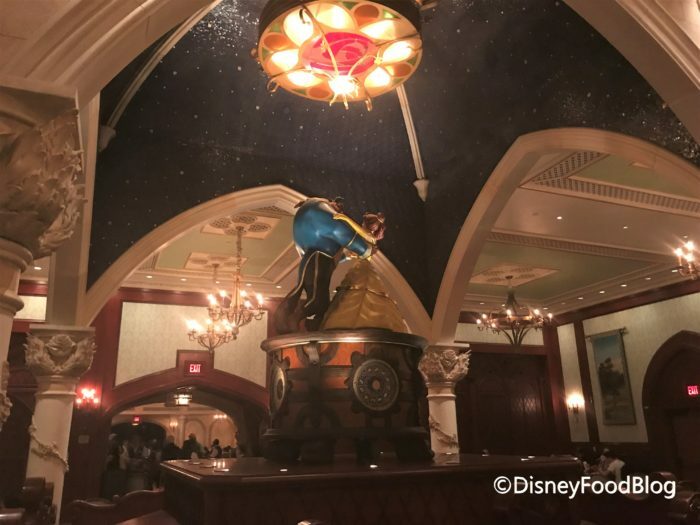 Check out our Be Our Guest Restaurant Photo Tour HERE! 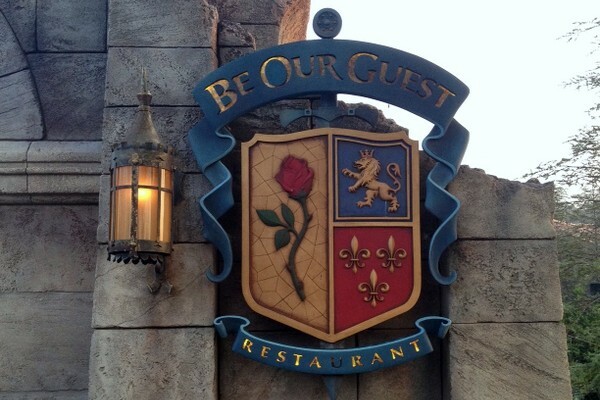 Be Our Guest Restaurant is unique in that breakfast and lunch are quick service, but dinner is a prix-fix table service (see our full review of the Be Our Guest Dinner here). It was also one of the first places to roll out Mobile Ordering. Since it opened, Be Our Guest has been a (very) popular spot for a high quality lunch that often outshines its table-service counterparts. Each of the three rooms have their own beverage stations, which also have napkins and utensils — real utensils — no plastic here! This is also a rare opportunity to refill your drinks as many times as you’d care to, which is especially great on a hot day. 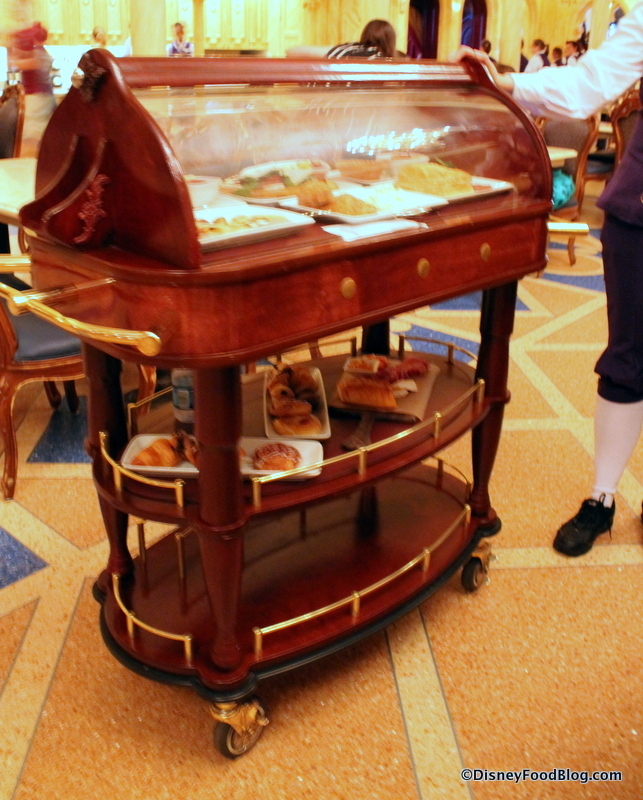 The servers will be by shortly to present your food on a beautiful rolling cart! 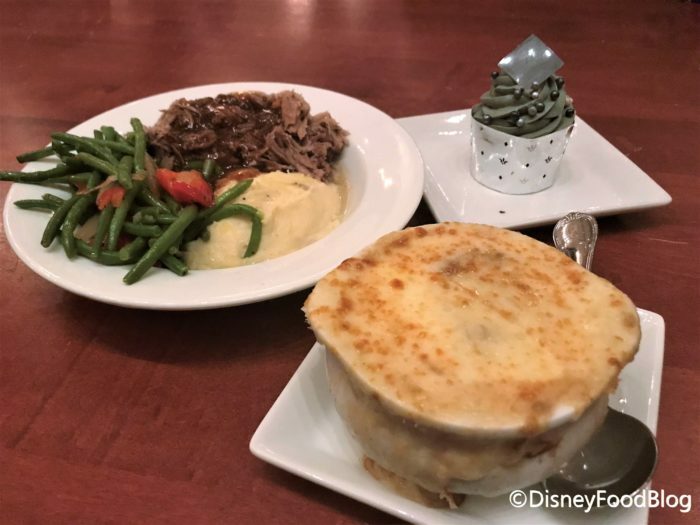 The menu here doesn’t change very often, so for this trip we chose three of our favorites: Braised Pork, French Onion Soup, and the Master’s Cupcake. You can see a review of MANY of the Be Our Guest Restaurant lunch offerings here! First up, a classic: French Onion Soup. 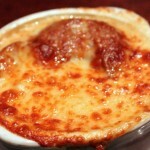 The French Onion Soup is lighter than the traditional recipe but it’s still very tasty! There is TONS of melted Gruyere cheese on top — which honestly is the whole reason for ordering this right? There were also lots and lots of onions, and a tasty broth. This soup still lands as a re-order for us! Not a French Onion fan? 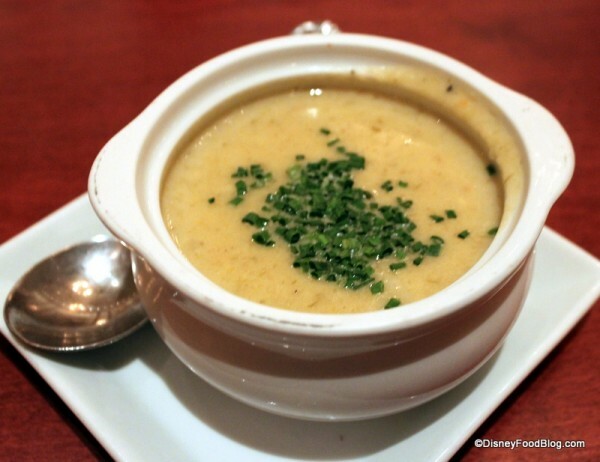 No problem — we also love the Potato Leek Soup which has been a hit on other visits. Next up, a DFB favorite: the Braised Pork! 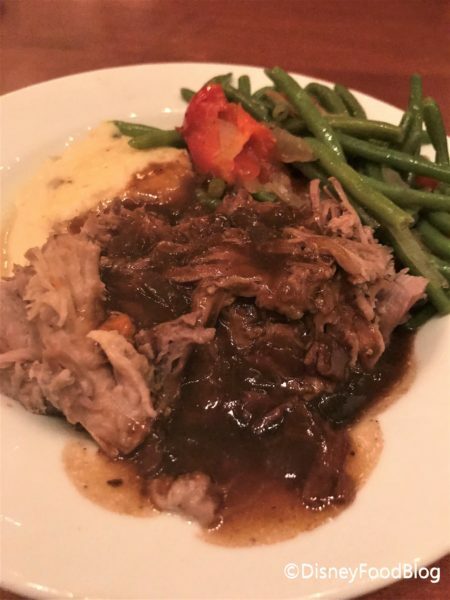 The Braised Pork is cooked Coq au Vin style, and is served with green beans and mashed potatoes. As we’ve noted in the past, this dish is pretty much perfection. It is honestly shocking that this is a quick-service meal. The green beans have a nice “snap” to them, and the mashed potatoes are buttery and delicious. But the pork is what’s truly amazing here. It comes out perfectly cooked every single time we order it. While it is on the higher end price-wise ($16.99) for an out-of-pocket meal, it’s certainly shareable, especially with a soup. And it’s absolutely an incredible use of a quick-service credit on the dining plan. 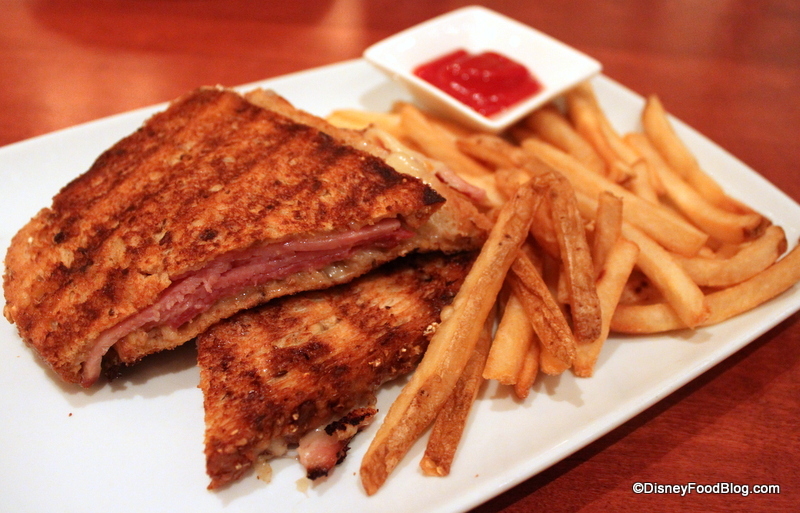 I also have to mention the Croque Monsieur. This classic ham and cheese sandwich complete with Bechamel sauce has also been one of our favorites at Be Our Guest Restaurant, and is another great lunch option! If you’re a vegetarian, or looking for a lighter bite, the Vegetable Quiche is a great choice. Filled with mushrooms, onions, tomatoes, and chives and served with a delicious green salad, this dish is a good option as a lighter choice. Last course: dessert. We once again had to try the grey stuff because well…it’s delicious! 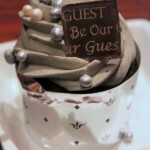 The Master’s Cupcake is a chocolate cupcake topped with the Grey stuff and edible pearls and a chocolate piece. 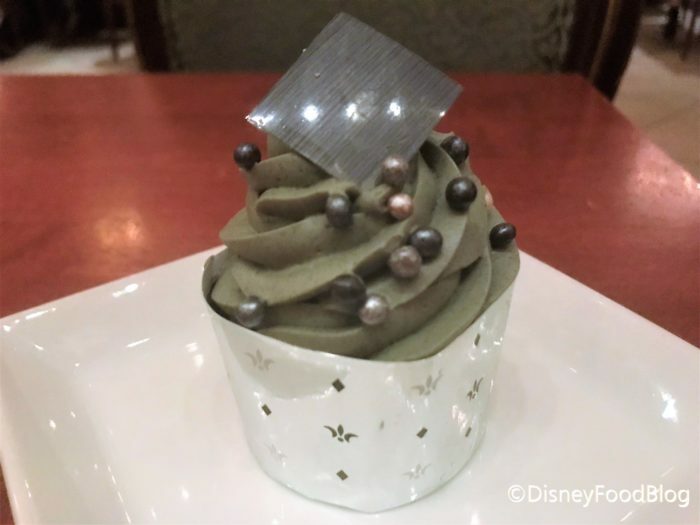 The Grey Stuff is a cookies and cream mousse, whose recipe is so exclusive most of the Cast Members don’t even know it! I guess Lumiere is good at keeping secrets. 🙂 While there’s nothing special about the cupcake itself, it’s pretty hard to pass up the grey stuff! Not in the mood for chocolate? 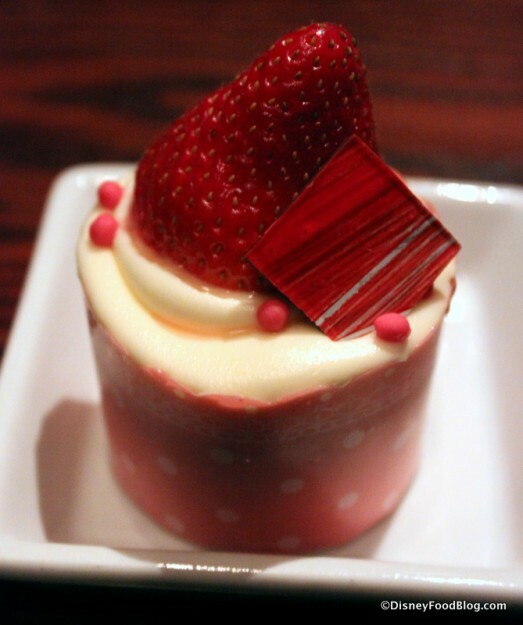 Then may we suggest the Strawberry Cream Cheese Cupcake. This is a vanilla sponge cupcake, topped with cream cheese icing, and stuffed with Strawberry Mousse Filling. Both cupcakes are a real treat, so we recommend getting both and splitting with your party! 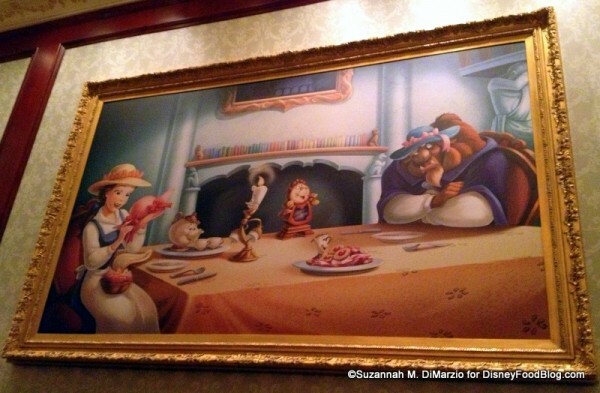 Be Our Guest Restaurant and delicious lunch? At this point it’s a Tale as Old as Time. 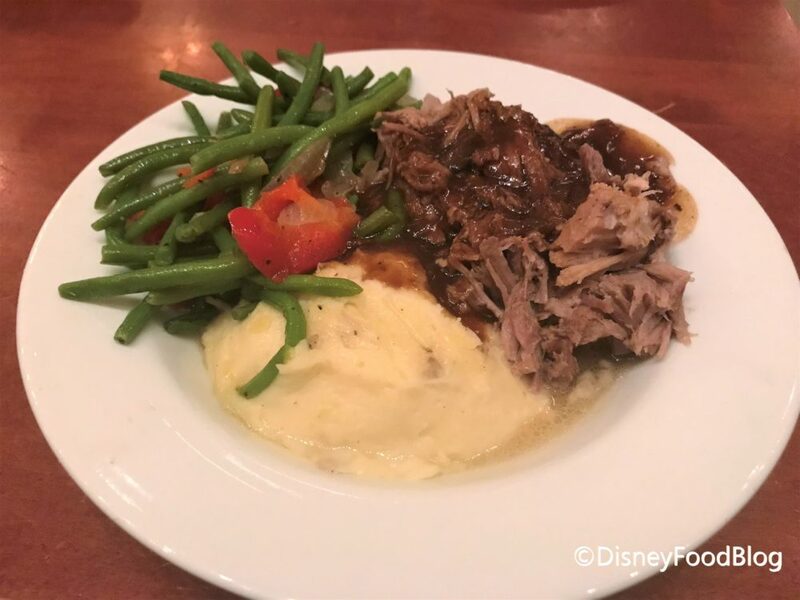 The braised pork continues to dazzle us as one of the best quick service lunches in Walt Disney World. 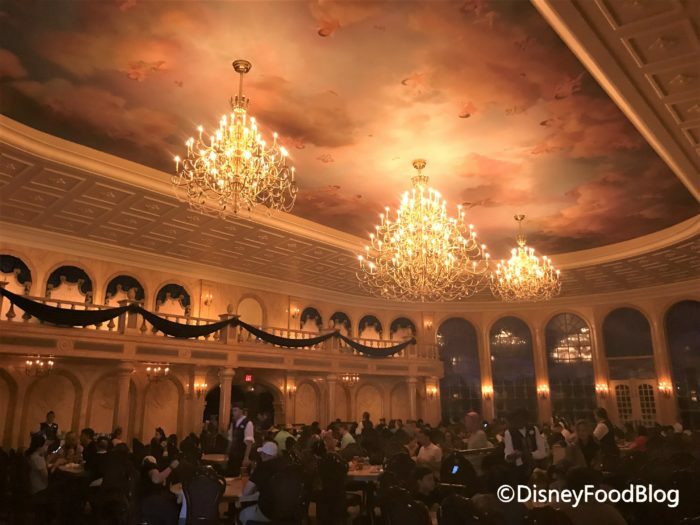 Plus, does it get more magical than eating in the Beast’s ballroom? There’s a reason that Be Our Guest Restaurant is one of, if not THE, most popular restaurants in Walt Disney World. You should absolutely try and book your reservation as soon as possible. But if you can’t snag one, don’t give up! Keep checking back and you never know when a little wish will come true. 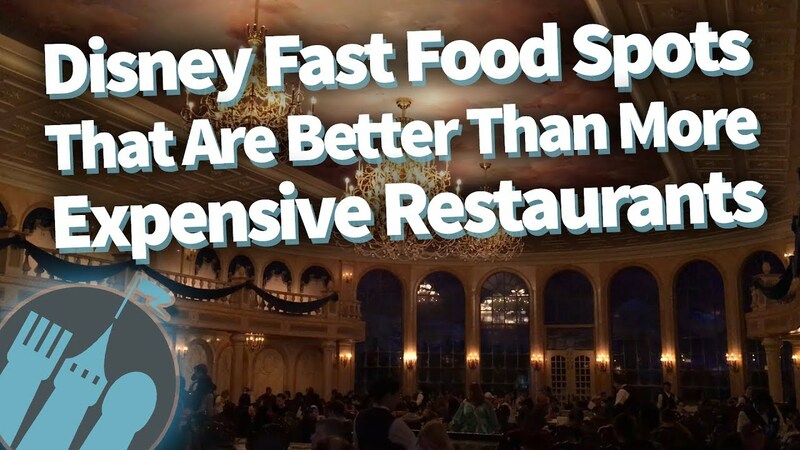 But here are a few things to remember — breakfast at Be Our Guest is horribly overpriced. 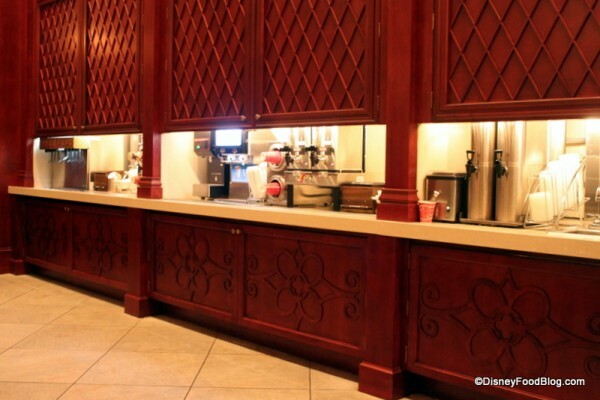 Unless you have the Disney Dining Plan and can use a snack credit for that meal, we don’t recommend booking it. It’s just not worth it to pay nearly $30 for a donut. The new prix-fixe dinner — at 2 Disney Dining Plan credits and a hefty pricetag — is also a bit over the top when it comes to cost. But lunch — lunch, my friends, is the sweet spot when it comes to Be Our Guest Restaurant. Decently priced (SO much cheaper than breakfast…WHY?!? ), the chance to see all three dining rooms (the Rose Gallery/Room is often closed off during dinner hours to serve as a prep kitchen), AND excellent food options. It’s a winner! In the meantime, check out this video of some of our FAVORITE quick-service spots that outshine full service restaurants! 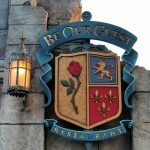 What do you think of Be Our Guest Restaurant? What are your favorite dishes? Let us know in the comments! 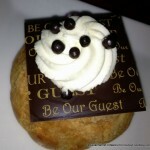 « NEW Chocolate Pastry Alert in Disney World’s Animal Kingdom! 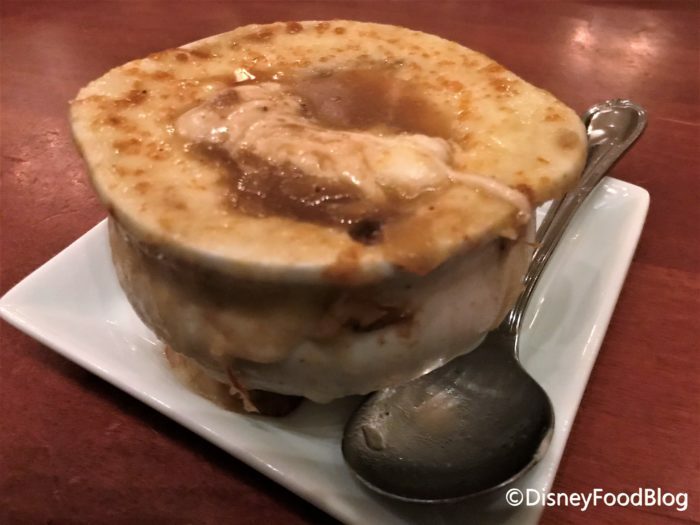 We have been there twice and both times shared the French Onion soup and the Braised Pork. One of the best meals ever. I think lunch is the best value for your money here. Lunch at BOG is a must for my son. We always do the advance order online and always sit in the Rose Room, our favorite. It’s nice to have several options for vegetarians (the soups are vegetarian too). We have tried everything on the menu and it has all been good. When we were there in late January for lunch, we had preordered and we were seated by a host. I didn’t think they did this at lunch. Is it only for preorders? Were they maybe testing out a new seating system? While I didn’t care which room we sat in, I was surprised to find that we weren’t given the option either (we were sat in the ballroom). We were told to help ourselves to the refreshments, and at that point, I hadn’t even remembered what drinks we ordered, and couldn’t pull up the order on the app, but they didn’t seem to be checking who ordered what drinks, as it seemed to all be “free” with your meal if that makes sense. The only ones they brought out with the meal were the chocolate milks for the kids. The food really was DELICIOUS though and we really enjoyed our lunch there, though they could light it up a smidge more with white light, as it’s so yellow and dim in there. Is this a current picture of the quiche? 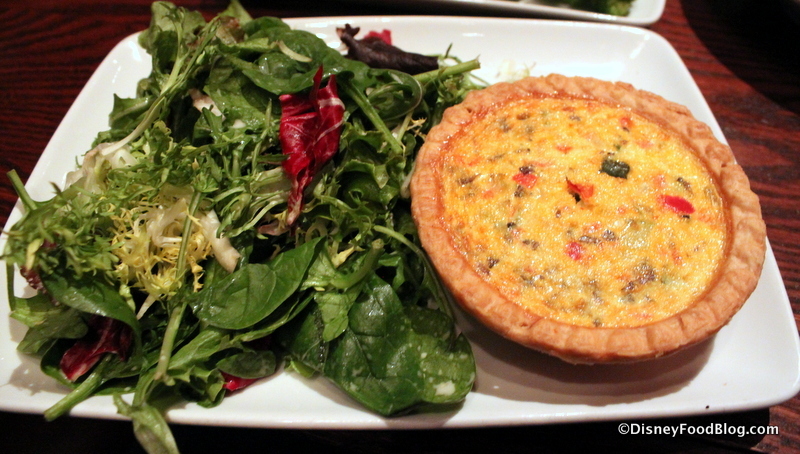 I was so disappointed when they changed it to the crustless quiche with a triangle pastry on top. I am so hopeful that the previous quiche has returned. It was my favorite! I’ve eaten there several times and ordered the braised pork dish every time and s exactly as y9ou described it. It is not your usual counter service meal that’s for sure. I love BOG. Just last week in the parking lot of MK we snagged a reservation for BOG! My kids were thrilled but I thought the breakfast was way overpriced -$28 for eggs, bacon, sausage and potatoes? This lunch service at BOG is to me the best way to enjoy the restaurant. The food is the same quality as dinner and if you are on the meal plan a far better deal than the dinner. Does anyone know if the kids meal version of the pork entree – Feast a la Beast – is the same quality and just a smaller portion size? It’s almost half the cost of the adult version, so I was eyeing ordering that for myself. We ate lunch here the last time we were at Magic Kingdom. We loved the experience, and would do it again, although next time we’d order differently. 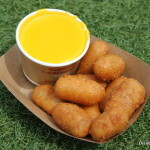 The portions are HUGE so I’d be more likely to share next time so we can still enjoy some of the other food throughout the park. I was too stuffed throughout the day to eat much of anything else. The braised pork is AMAZING! I usually love French Onion Soup but I wasn’t a huge fan of the soup here. I think it had too much cheese, which is something I never thought I’d say in my entire life. The Master’s Cupcake was a tasty way to finish the meal. We just split it between several of us so we could each have a few bites of something sweet at the end. It’s definitely a cool dining experience overall. Thanks so much for this review. As always, it contained lots of very solid, useful information, and your point about lunch being the “sweet spot” for enjoying this dining spot is amply demonstrated. For sure, lunch here is on my “must do” list! This is our favorite place to eat lunch on property! Question about dinner though…my husband, an almost 7 year old son & I will be there for my husband’s birthday soon. We thought about splurging on dinner this time since we have never done it, but the price (we would pay out of pocket) has us second guessing ourselves. What would you recommend based on the new menu & pricing?? Was here at BOG for lunch in October, the first visit for both my birthday celebrating sisters. I was very disappointed. the food came out cold. We advised a castmember of this issue, and they replaced the food. This replacement food was still not hot, I wouldn’t even consider it warm. Since we had fastpasses we chalked it up as a no return place. I just spoke to a friend that was at lunch in February, their food was cold also. Sorry, but this is now off the food list. That’s likely why reservations are available for lunches now. Too bad, it used to be a very nice lunch and atmosphere. Laura, the DFB team recommends the Lobster Bisque (app) and the Center Cut Filet Mignon (entree).